US$ 580 / person ? Arrival to Paro. Visit of the National Museum and Paro dzong (Rinpung dzong), the castle-monastery where Bernardo Bertolucci’s Little Buddha film was shot. Try Bhutanese dress and make beautiful photos in that in front of Paro castle. The pristine Kyichu lhakhang is one of the two oldest temples built in Bhutan, built in 7th century by Tibetan warrior king Songtsen Gampo. (Program is subject of the arrival time). 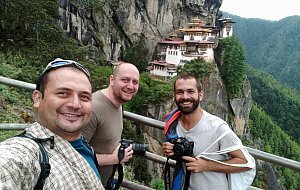 2 Paro – Thimphu Climb to Taktsang gomba (Tiger’s Nest), is the highlight of the tour. While the hike seems to be hard, it’s very rewarding. If you don’t feel so strong, you can climb just halfway to cafeteria with nice view of the place. After hike drive to Thimphu with stop at Tachog lhakhang, to see the bridge reconstructed with old chains smithed by ancient saint and bridge builder Thangton Gampo. Evening stroll in Thimphu to see the people praying at Memorial chorten, stupa commemorating 3rd king of Bhutan. 3 Thimphu Early morning drive to Dochu-la pass (3015m). In clear weather you can see stunning mountain panorama. 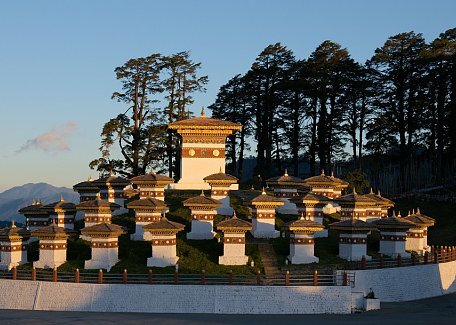 Drive back to Thimphu and visit gigantic statue of Buddha overlooking the valley and walk to striking city viewpoint. Walk in Norzin lam street and see the traffic police signaling in junctions. Thimphu is only capital in the world without the traffic lights. Finish walk in main postal office with shop where beautiful and valuable Bhutanese stamps can be bought. Finish walk at handicraft market where many interesting Bhutanese souvenirs can be seen and bought for reasonable price. Visit hand paper factory a Thangkha painting centre, where young artists learns the skills of their forefathers. After that Changankha lhakhang, the oldest place of worship in the valley. Evening visit of Tashicho dzong, the castle, which serves as seat of the king and government. 4 Departure If time permits, you can make some additional sightseeing in the morning or spend time in leisure. Then drive to Paro and departure by flight or take 6 hours drive to land border in Phuntsholing. Trekking: This tour can be easily combined with any trek, including Jomolhari Yaksa Trek (6 days) or Druk Path Trek (5 days). Please inquire for more informations. India extension: There is possibility to extend the tour to India via land border in Phuntsholing/Jaigon. Just 1 hour drive from there is Jaldhapara National Park with excellent elephant safari. In 5 hours drive you can reach Darjeeling, the mecca of every tea lover, and 2 more hours will take to reach Gangtok, capital of Sikkim. We will be happy to help with travel arrangements in India too!